Goodman debuts strongly with this intricately plotted and captivating tale of buried secrets. 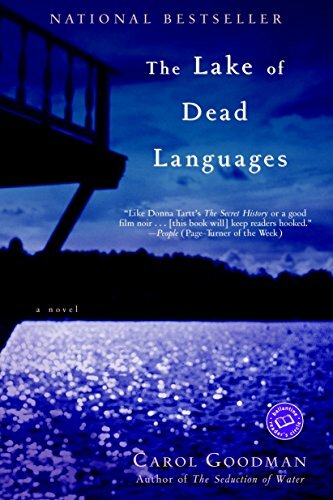 When Jane Hudson returns to her high school alma mater, the Heart Lake School for Girls, as a Latin teacher, tragic events of the past begin to resurface. Twenty years earlier at Heart Lake, roommates Jane, Lucy and Deirdre were inseparable. They studied the classics together under the tutelage of the mesmerizing Helen Chambers, sneaking out for midnight skinny dipping in the lake and meeting Lucy's brother, Matt, in the sheltered woods of the campus. Their clandestine friendship ended in the winter of senior year, amid scandal and suicide. Only Jane knows the truth behind the mystery of Matt and the other girls' deaths and now, two decades later, the secret comes back to haunt her: someone has found her missing journal, written during that tragic time, and begins a macabre re-enactment of the past. When one of Jane's troubled young students is found dead in the frigid waters of Heart Lake, an apparent suicide, the school board suspects Jane is the harmful influence. The dark and shocking secrets of Jane's adolescence, revealed gradually in flashbacks, progressively absorb the reader until the final disquieting denouement. Sexual rites, pagan rituals and forbidden love all come together in this deft exploration of youthful innocence and guilt. Goodman weaves ancient mythology with modern legend into a chilling and evocative story of deception and complicity. Goodman has also written Seduction of Water and The Drowning Tree, both of which have a very similar tone to this book. I will be passing this book along to Little-Red, who will be passing it along to someone in her Adult Literacy class as part of her presentation on BookCrossing. So enjoy, whoever ends up with it!